Have you ever wondered, why drugs trafficking and production in the world has grown out of control, while more Black and Brown people in the United States are incarcerated for drugs possession and small sales? 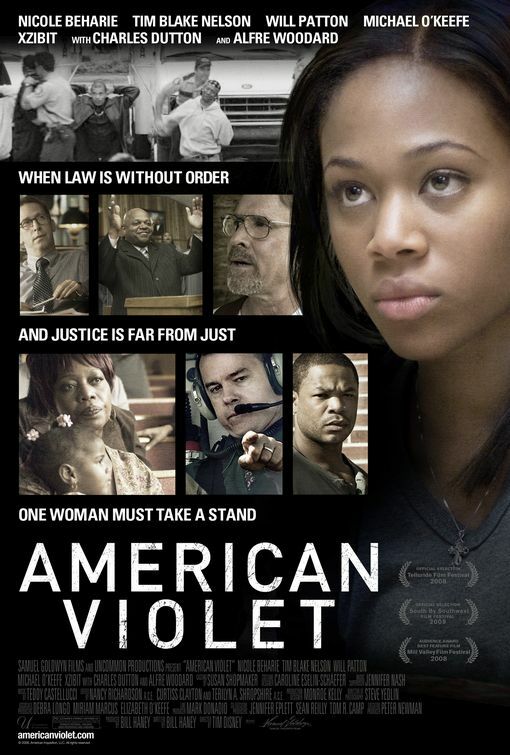 Then you have to -no- you must see the film American Violet. Regardless of the anti-drug rhetoric and huge funds spending in anti-drugs trafficking programs all over the world, production of cocaine in Colombia and opium in Afghanistan have grown continuously. Dee Roberts, a 24 year-old African American single mother of four young girls living in a small Texas town is barely making ends meet on a waitress salary and government subsidies. On an early November 2000 morning while Dee works a shift at the local diner, the powerful local district attorney leads an extensive drug bust, sweeping her Arlington Springs housing project with military precision. Police drag Dee from work in handcuffs, dumping her in the squalor of the women’s county prison. Indicted based on the uncorroborated word of a single and dubious police informant facing his own drug charges, Dee soon discovers she has been charged as a drug dealer. Even though Dee has no prior drug record and no drugs were found on her in the raid or any subsequent searches, she is offered a hellish choice: plead guilty and go home as a convicted felon or remain in prison and fight the charges thus, jeopardizing her custody and risking a long prison sentence. Despite the urgings of her mother, and with her freedom and the custody of her children at stake, she chooses to fight the district attorney and the unyielding criminal justice system he represents. Joined in an unlikely alliance with an ACLU attorney and former local narcotics officer, Dee risks everything in a battle that forever changes her life and the Texas justice system. “Everyone is feeding off of our down-trodden condition to feed their capitalism, greed and lust for money. They are buying prison stock on the market and this is why they want to silence the restorative voice of Minister Louis Farrakhan, because he is repairing those who fill and would support the prison system as slaves,” said student minister Abdullah Muhammad of the Nation of Islam Prison Ministry. The report states that the rising trend stems from more than a parallel increase in crime or surge in the population at-large, but it is driven by policies that put more criminals in prison, extending their stay through measures like California’s Three Strikes Law. Attorney Barbara Ratliff, an L.A.-based reparations activist, said the prison industrial complex’s extension of the slave plantation plays out in a pattern of behavior that Black people must study in order to survive. “I’m not talking about behavior of the individual incarcerate, but the pattern of treatment that digs into institutional racism. Corporate profit from prisons is no different than how slave owners received benefit from their labor, and that impact remained even after slavery. For instance, freed Blacks were arrested and put on chain gangs for their labor which continued to benefit slave owners, so this is no accident,” she said. The story of Dee Roberts occurred 9 years ago, but her struggle is the same of so many Americans today. Currently we see an increase number of Black and Brown people incarcerated by Homeland Security Department, because they don’t have documents to work in the United States. Is the prison system a way to practice justice or is just a network of business deals? I saw the movie, it’s really good and make you realize that we black people are in danger in this country! If we’re not careful about our surroundings and who is in power to run our lives… go see it and bring friends, will open your eyes! Fernando on Haitian slaves gets maimed in the Dominican Republic for "being lazy" – please take action!